Protocols and Methodologies in Preclinical and Clinical Cardiac Magnetic Resonance Imaging (2017). C. Constantinides (Editor). Springer-Verlag Publications (published, 13 October 2017). Introduction to Magnetic Resonance Imaging (MRI): The Basics (2014). C. Constantinides, CRC Press (Taylor and Francis): Florida (Published – Available from: http://www.crcpress.com/product/isbn/9781482217315). Latest Advances in Pre-Clinical and Clinical Cardiovascular Magnetic Resonance Imaging (2013). C. Constantinides (Editor). Bentham Science Books: Amsterdam, The Netherlands (Published – Available from: http://www.eurekaselect.com/119385/volume/1). C. Constantinides (2017). Cardiac Multinuclear MRI. Constantinides C (Editor), Protocols and Methodologies in Basic Science and Clinical Cardiac Magnetic Resonance Imaging (published, 13 October 2017). S. Angeli, C. Constantinides (2014). Regional Cardiac Function: Across Mammalian Species Comparison – The Paradigm of the Mouse for MR Image-Based Phenotyping. Constantinides C (Editor), Latest Advances in Cardiovascular Imaging, Amsterdam: Bentham Science Books (Published – Available from: http://www.eurekaselect.com/119385/volume/1). C. Constantinides (2012). Murine Cardiac Hemodynamics: The Development and use of Invasive Catheters, and the Emergence of New Methodologies. Herzaki (Ed), Hemodynamics: Monitoring, Theory and Applications, New York: NOVA Publications (published, Chapter 3, pp. 25-48). Christakis Constantinides (2012). Study of the Murine Cardiac Mechanical Function Using Magnetic Resonance Imaging: The Current Status, Challenges, and Future Perspectives. Practical Applications in Biomedical Engineering, Adriano O. Andrade, Adriano Alves Pereira, Eduardo L. M. Naves and Alcimar B. Soares (Ed. ), ISBN: 978-953-51-0924-2, InTech, Available from: http://www.intechopen.com/books/practical-applications-in-biomedical-engineering/study-of-the-murine-cardiac-mechanical-function-using-magnetic-resonance-imaging-the-current-status-and-future-perspectives. C. Constantinides. Introduction to MRI: The Basics. Translation in Greek, Pre-publication (May 2018). C. Constantinides. Physiology and Bioengineering: A Teaching Primer. 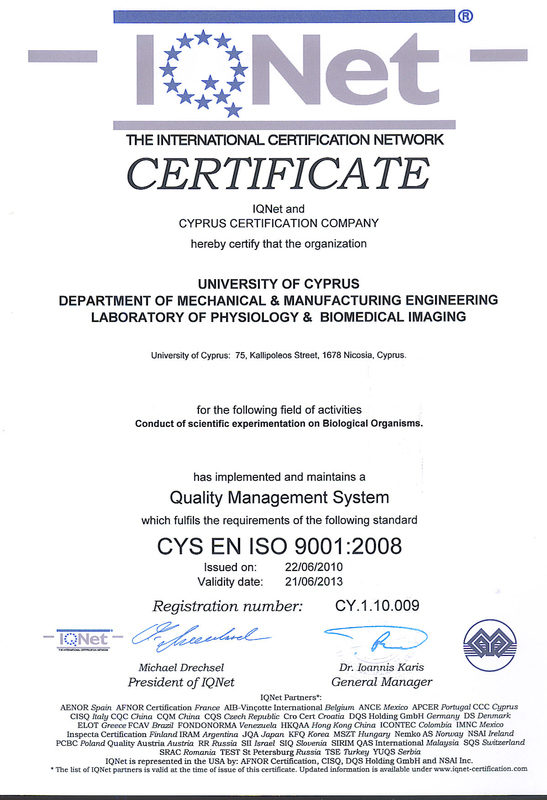 U. Cyprus, Fall 2006 [158 pages]. Part of the Primer includes translation of a book chapter from the Book «Physiology of the Heart», A. Katz, with the author’s permission. Stress and Strain Characterization of a Dynamically Controlled Cardiac Phantom using Computational Fluid and Structural Dynamics (in preparation). Charalambous N, Angeli S, Narracott A, Rahbari R, Hossein M, Pilakoutas K, Michaelides K, Tsagkarakis V, Constantinides C [Tentative]. Improved Cellular Uptake of Perfluorocarbon Nanoparticles for In Vivo Murine Cardiac 19F MRS/MRI and Temporal Tracking of Progenitor Cells. Constantinides C, McNeill E , Carnicer R, Al Haj Zen A, Sainz-Urruela R, Shaw A, Patel J, Swider E, Alonaizan R, Potamiti L, Hadjisavvas A, Padilla-Parra S, Kyriacou K, Srinivas M, Carr CA. Nanomedicine: Nanotechnology, Biology, and Medicine (accepted), November 2018. In Vivo Tracking and 1H/19F MRI of Biodegradable Polyhydroxyalkanoate/Polycaprolactone Blend Scaffolds Seeded with Labeled Cardiac Stem Cells. Constantinides C, Basnett P, Lukasiewicz B, Carnicer R, Swider E, Majid Q, Srinivas M, Carr CA, Roy I. ACS AMI (published), July 2018 [e-copies available upon request]. Fast, Quantitative, Murine Cardiac 19F MRI/MRS of PFCE-labeled Progenitor Stem Cells and Macrophages at 9.4T. Constantinides C, Mahon M, McNeill E, Carnicer R, Swider E, Srinivas M, Carr C, Schneider J. Plos One, 11 January 2018. In-Vivo Epicardial Force and Strain Characterization in Normal and MLP-Knockout Murine Hearts. Physiol. Measur. 1573-1590, 2015. Michaelides M, Georgiadou S, Constantinides C.
Recent Advances in Image-Based Stem-Cell Labeling and Tracking, and Scaffold-Based Organ Development in Cardiovascular Disease. Recent Patents in Medical Imaging, 4(2):110-126, 2014. Constantinides C, Carr C, Schneider J (invited submission, peer-reviewed – Available from http://benthamscience.com/journal/abstracts.php?journalID=rpmi&articleID=124669 and from http://eurekaselect.com/124669). A High-Resolution Cardiovascular Magnetic Resonance Diffusion Tensor Map from Ex-Vivo C57BL/6 Murine Hearts. J. Cardiovascular Magnetic Resonance, 16:77, 2014. Angeli S, Befera N, Peyrat JM, Calabrese E, Johnson GA, Constantinides C. [Available from: http://jcmr-online.com/content/16/1/77. Fiber map data, including the mean diffusion tensor, the mean geometry and tractography can be downloaded here; alternatively, download from this mirror site]. A Semi-Automated Quality Assurance Toolbox for Diagnostic Imaging. IJBET 14(2):159-180, 2014. Constantinou C, Grondoudes A, Christoforou A, Lanitis A, Constantinides C.
Epicardial Elasticity Measurements of the Ex-Vivo Murine Heart using Atomic Force Microscopy. IJNT 10(12):1064, 2013. Kossivas F, Cao L, Michaelides M, Kyprianou A, Constantinides C.
Stress-Strain Characteristics of Elastomeric Membranes under Uniaxial Testing: Theoretical Formulation, Experimental Tests, and Computational Validation. Mechanics of Advanced Materials and Structures. Angeli S, Panayiotou C, Psimolofitis E, Nicolaou M, Constantinides C. [Available from: http://www.tandfonline.com/eprint/eDAJrrbwEKsQPEPJ5Vfy/full]. A Prototype Device for 3D Passive Epicardial Elasticity Mapping of the Murine Myocardium using AFM. Experimental Techniques 2013. doi:10.1111/ext.12034/1-6. Constantinides C, Kossivas F, Epameinoda P, Michaelides M, Rebholz C.
Emulation of Human and Rodent Cardiac Motion with a Computer-Controlled Cardiac Phantom using DENSE MRI. NMR Concepts in Magnetic Resonance Part A, 42(3):59-71, May 2013. Constantinides C, Zhong X, Tzangarakis V, Cofer G, Gravett R.
Biosourced Amphiphilic Degradable Elastomers of Poly(glycerol sebacate)s: Synthesis and Network and Oligomer Characterization. Macromolecules 46(3):622-630, 2013. doi:10.1021/ma3016882. Kafouris D, Kossivas F, Constantinides C, Nguyen NQ, Wesdemiotis C, Patrickios C.
Elimination of Mutual Inductance in NMR Phased Arrays: The Paddle Design Revisited. Journal of Magnetic Resonance 222:59-67, 2012. Constantinides C, Angeli S.
MRI Based Morphological Modeling, Synthesis, and Characterization of Cardiac Tissue Mimicking Materials. IOP Biomedical Materials 7(3), 2012.doi:10.1088/1748-6041/7/3/035006. Kossivas F, Angeli S, Kafouris D, Patrickios C, Constantinides C.
Underestimation of Murine Cardiac Hemodynamics using Invasive Catheters: Errors, Limitations, and Remedies. Journal of Cardiovascular Engineering and Technology (CVET) 3(2):179-193, 2012. doi:10.1007/s13239-012-0084-8, June 2012. Constantinides C, Angeli S, Kossivas F, Ktorides P.
Murine Cardiac Catheterizations and Hemodynamics: On the Issue of Parallel Conductance – A Quantitative Study. IEEE-TBME 58(11):3260-8, 2011. Constantinides C, Angeli S.
Morphological Studies of the Murine Heart Based on Probabilistic and Statistical Atlases. Computerized Medical Imaging and Graphics 36:119-129, 2012. doi:10.1016/j.compmedimag 2011.07.001. Perperidis D, Bucholz E, Johnson GA, Constantinides C.
Murine Cardiac Hemodynamics following Manganese Administration under Isoflurane Anesthesia. Annals of Biomedical Engineering, 39(11):2706-2720, 2011. doi:10.1007/s10439-011-0367-5. Constantinides C, Angeli S, Mean R.
Intercomparison of Performance of RF Coil Geometries for High Field Mouse Cardiac MRI. Concepts of Magnetic Resonance Part A, Vol. 38A(5):236-252, 2011. doi:10.1002/cmr.a.20225. Constantinides C, Angeli S, Gkagarelis S, Cofer G.
Effects of Isoflurane Anesthesia on Murine Cardiovascular Function. ILAR 52:e21-31, 2011. Constantinides C, Mean R, Janssen BA. Tracking of PLGA-PFCE-labeled Cardiac Stem Cells Seeded on Novel Biodegradable Poly(3-hydroxyoctanoate) Scaffolds Implanted on the Murine Myocardium using 1H and 19F MRI/MRS. Christakis Constantinides, Pooja Basnett, Barbara Lukasiewicz, Ricardo Carnicer Hijazo, Mangala Srinivas, Carolyn Carr, and Ipsita Roy. ISMRM 2018, Paris, France (accepted February 2018). In Vivo Murine Cardiac 19F MRI and Tracking of PFCE- and FuGENE-labeled Progenitor Stem Cells in the C57BL/6 Mouse. Christakis Constantinides, Ricardo Carnicer Hijazo, Andrew Shaw, Jyoti Patel, Edyta Swider, Mangala Srinivas, and Carolyn Carr. ISMRM 2018, Paris, France (accepted February 2018). Comparison of Labeling Capacity for Protamine-sulphate-conjugated and FuGENE-labeled Progenitor Cardiac Stem Cells using Perfluorocarbon Nanoparticle Labels for In Vivo Murine Cardiac 19F MRI/MRS. Christakis Constantinides, Akhilesh Rai, Mangala Srinivas, Lino Ferreira, and Carolyn Carr. ISMRM 2018, Paris, France (accepted February 2018). Post-mortem Cardiac and Skeletal Muscle 19F MRI of PFCE-labeled and FuGENE-transfected Cardiac Progenitor Stem Cells in the C57BL/6 Mouse. Christakis Constantinides, Ricardo Carnicer, Mahon L. Maguire, Eileen McNeill, Ayman Haj Al Zen, et al. ISMRM, Hawaii, May 2017. Temporal Assessment of In Vitro Survival, Uptake Efficiency, and Fluorescence of Cardiac Stem Cells Labelled with PLGA-PFCE Nanoparticles and Transfected with FuGENE. Christakis Constantinides, Ayman Haj Al Zen, Eileen McNeill, et al. ESMI, Cologne, Germany, April 2017. Effects of Inhalational Isoflurane Anaesthesia on 19F MRS/MRI of the In Vivo Mouse at 9.4T. ISMRM Workshop on Molecular & Cellular MRI: Focus on Integration: Amsterdam, Netherlands, June 2016. Christakis Constantinides, Mahon L. Maguire, Leeanne Stork, Mangala Srinivas, Edyta Swider, Carolyn A. Carr, Jurgen E. Schneider. Improvements in the Cellular Uptake of Perfluorocarbon Nanoparticles and 19F MRS/MRI Detectability using the Transfection Agent FuGENE. ISMRM Workshop on Molecular & Cellular MRI: Focus on Integration: Amsterdam, Netherlands, June 2016. Christakis Constantinides, Eileen McNeill, Matt Benson, Raquel Sainz Urruela, Sergi Padilla, Sophia Malandraki-Miller, Mahon L. Maguire, Edyta Swider, Sahar Ghaffari, Carolyn A. Carr, Mangala Srinivas, Jurgen E. Schneider. Residual Strain in the Left Ventricular C57BL/6 Myocardium. Experimental Biology 2015, Boston, USA. Angeli S, Michaelides M, Constantinides C.
Elasticity Measurements from Murine Left Ventricular HL-1 Cardiomyocytes using Atomic Force Microscopy. Experimental Biology 2015, Boston, USA. Kossivas F, Michaelides M, Hadjisavvas A, Kyprianou A, Kyriacou K, Constantinides C.
NMR Phased Arrays: Past, Present and Future – Practical Implications from Mutual Inductance Elimination using the Paddle End-Ring Design. BIT’s 3rd Annual Conference Expo AnalytiX, 25-28 April 2014, Dalian China (Invited presentation). Constantinides C.
A High-Resolution Cardiomyofiber Atlas of the Murine Heart. ISMRM May 2014, Milan, Italy. Angeli S, Befera N, Peyrat JM, Calabrese E, Johnson GA, Constantinides C.
Myocardial Force and Strain Comparisons in Control and MLP Deficient Mice. Experimental Biology 2014, April, San Diego, USA. Michealides M, Georgiadou S, Constantinides C.
Computational, Image-Based, and Experimental Stress-Strain Comparisons of Elastomers. ESB 2013, Patra, Greece. Angeli S, Psimolophitis E, Nicolaou M, Constantinides C.
Direct Epicardial Force and Strain Measurements from the in vivo Murine Heart. Experimental Biology 2013, Boston, USA. Constantinides C, Michaelides M, Georgiadou S.
Construction of a Fiber Atlas of the Murine Heart. ISMRM 2013, Utah, USA. Angeli S, Befera N, Cofer G, Johnson GA, Constantinides C.
Stress and Strain Characterization of a Dynamically Controlled Cardiac Phantom using Computational Fluid and Structural Dynamics. ISMRM 2013, Utah, USA. Charalambous N, Michaelides K, Psimolofitis E, Tzagarakis V, Michaelides D, Angeli S, Constantinides C.
Functional Polymer Networks: Ampliphilicity, Ampholyticity and Degradability. PNG 2012. Patrickios CS, Kepola EJ, Kafouris D, Constantinides C.
A Prototype Device for 3D Passive Elasticity Mapping of the Murine Myocardium using AFM. Biomedical Engineering Society (BMES), October 2012, Atlanta, Georgia, USA. Constantinides C, Kossivas F, Epameinoda P, Sofocleous K, Keravnou C, Zachariou S, Socratous C, Hadjizorzis M, Rebholz C.
Epicardial Elasticity Measurements of the Ex-Vivo Murine Heart using Atomic Force Microscopy. Biomedical Engineering Society (BMES), October 2012, Atlanta, Georgia, USA. Kossivas F, Michaelides M, Cao L, Kyprianou A, Truskey G, Constantinides C.
Cardiac Tissue Regeneration: MRI Based Morphological Modeling, Synthesis, and Characterization of Tissue Mimicking Materials. Biomedical Engineering Society (BMES), October 2012, Atlanta, Georgia, USA. Angeli S, Kossivas F, Kafouris D, Patrickios CS, Tzagarakis V, Constantinides C.
Poly(glycerol sebacate) Degradable Bioelastomers: Synthesis, and Oligomer Precursor and Polymer Network Characterization. Macro 2012, 44th IUPAC World Polymer Congress, Macromoleculars in Biotechnology and Medicine Symposium, Blacksburg, Virginia, USA, June 2012. Kafouris D, Kossivas F, Constantinides C, Nguyen NQ, Wesdemiotis C, Patrickios CS. Minimizing Mutual Inductance in NMR Phased Arrays: The Paddle End-Ring Design Revisited. Proceedings of the International Society of Magnetic Resonance in Medicine (ISMRM), Melbourne, Australia 2012. Constantinides C, Angeli S.
Understimation of Murine Cardiac Hemodynamics using Invasive Catheters. Experimental Biology 2012 (FASEB Journal), San Diego, USA. Constantinides C, Angeli S, Kossivas F, Ktorides P.
Synthesis and Properties of Poly(Glycerol Sebacate) Elastomers: Effect of Composition. American Chemical Society, USA, 2012. Kafouris D, Kossivas F, Nguyen NW, Wesdemiotis C, Constantinides C. Patrickios C.
Synthesis and Characterization of Poly(glycerol sebacate)s: Amphiphilic Degradable Elastomers. Cyprus Greece Binational Conference, Limassol, Cyprus, October 2011. Kafouris D, Kossivas F, Constantinides C, Nguyen NQ, Wesdemiotis C, Patrickios C.
Computational and Experimental Validation of Electric Field Propagation in Miniature Catheter for Parallel Conductance Estimation. Proceedings of the American Heart Association (Circulation Research), New Orleans, July 2011. Angeli S, Mean R, Constantinides C.
A Novel Cardiac Phantom to Study Murine and Human Cardiac Motion and Function using MRI. Proceedings of the International Society of Magnetic Resonance in Medicine, Montreal 2011. Constantinides C, Nearchou D, Constantinou C, Ktorides P, Gravett R, Tzagarakis V.
Comparison of Regional Myocardial Function in the Human and the Mouse. Proceedings of the International Society of Magnetic Resonance in Medicine, Montreal 2011. Constantinides C, Rueckert D, Perperidis D.
Quantification of Hemodynamics in Murine Myocardium following Manganese Infusion. Proceedings of the Experimental Biology (FASEB Journal), Washington DC, April 2011. Constantinides C, Angeli S, Mean R.
A Novel Spiral Radiofrequency Coil for High Field Mouse Cardiac Imaging. 32nd Annual International Conference of the IEEE Engineering in Medicine and Biology Society (IEEE-EMBS) ‘Merging Medical Humanism and Technology’, August 2010, Argentina, Argentina, September 2010. Constantinides C, Gkagarelis S, Angeli S, Cofer G.
Heart rate and blood pressure variability effects as a result of oxygen and nitrous oxide administration in the anesthetized Mouse. 32nd Annual International Conference of the IEEE Engineering in Medicine and Biology Society (IEEE-EMBS) ‘Merging Medical Humanism and Technology’, August 2010, Argentina, Argentina, September 2010. Constantinides C, Mean R, Janssen BA. Four-Dimensional Mouse Cardiac Imaging and Quantification of Mechanical Function using MRI. RAHMS 2nd International Conference “Recent Advances in Health and Medical Sciences”, July 2010, Paphos, Cyprus. Constantinides C, Mean R, Aristocleous N, Perperidis D.
An Optimal Physiologic Model for Study of Murine Cardiac Function under Inhalational Anesthesia, International Society for Magnetic Resonance in Medicine, Proceedings of the ISMRM, Stockholm, May 2010. Constantinides C, Mean R, Hedlund L.
Static and Dynamic Cardiac Modelling: Initial Strides and Results towards a Quantitatively Accurate Mechanical Heart Model. Proceedings of the IEEE Society in Biomedical Imaging, Rotterdam, April 2010. Constantinides C, Aristocleous N, Johnson GA, Perperidis D.
Interstrain Comparisons of Murine Global Cardiac Function using MRI. Proceedings of the ISMRM, Stockholm, May 2010. Constantinides C, Aristokleous N, Fokianos K, Brandenburg J, Perperidis D.
Effects of Isoflurane Anesthesia on Murine Glucose Metabolism. Proceedings of Experimental Biology (FASEB Journal), Anaheim, California, April 2010. Constantinides C, Mean R, Janssen B, Hedlund L.
Morphological Studies of the Murine Heart Based on Probabilistic and Statistical Atlases. Proceedings of the International Society for Magnetic Resonance in Medicine, Hawaii, May 2009. Perperidis D, Bucholz E, Johnson GA, Constantinides C.
Morphological and Functional Motion Studies of the Murine Heart based on Probabilistic and Statistical Atlases. Radiological Society of North America, November 2008. Perperidis D, Bucholz E, Johnson GA, Constantinides C.
C. Constantinides. Introduction to Medical Diagnostic Modalities Handbook. 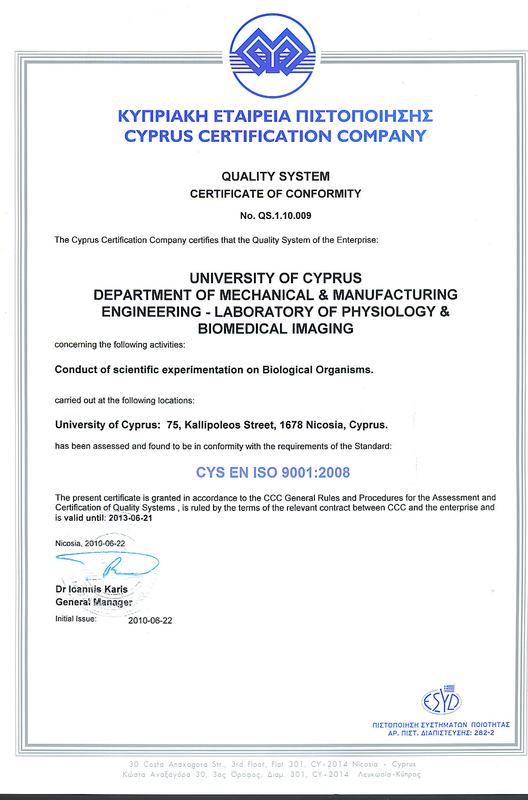 U. Cyprus, Fall 2007 [213 pages] [with translated sections from Medical Diagnostic Systems, Koutsouris, Nikita, Pavlopoulos, Tziola Publications. Permission sought from Dr. Pavlopoulos] C. Constantinides. Introduction to Magnetic Resonance: A Primer. U. Cyprus, Fall 2006 [175 pages] [with translated contributions from McVeigh E. Permission sought from Professor E. McVeigh] C. Constantinides. Mechatronics Teaching Handbook and Laboratory Practicals, U. Cyprus, Fall 2006 [158 pages] [with translated Chapters from Poularikas and Seely, Elements of Signals and Systems – Permission sought and secured from Professor Poularikas].